When one of the Chase representatives would happen to get me at a semi-good enough time to take a call, and to patiently go through all the stupid ‘required’ verifications, name (see: please call me A. ), complete address, phone, name of my employer, where the vehicle is parked at night, who the primary driver is, who is my insurance carrier, etc. etc. etc. I at first answer all their invasive series of questions like well, most of the above but I just love (sic) the ‘what is the reason that caused you to fall behind on your payment’ question? So, we get through all the questions, now to the ‘meat’ of the call, the money. The representative then asks: May I take your payment now? I can schedule it for as late as this Friday. In my case, I would usually explain that I would bring in a cash payment to one of the branch locations on Monday, Tuesday whenever I next expected to be able to make said payment. 2-5 hours later, the phone calls begin.. guess who? Chase again, supposedly knowing nothing of the previous representatives earlier call and discussion, thereby proceeding to badger me through their &^%$ series of verifications, etc. etc. etc. As I try to break in to ask the representative to “please look at their records, I already spoke with someone about my payment earlier today”, I am interrupted with SIR, we have to go through these questions before I can even access your account. I’m now over the phone calls, no-more phone calls. My right to peaceful use is not going to be constantly interrupted by Chase and a systematic auto-dialed collection calls from hell! This troubling story was submitted by a reader. There are so many things that Chase seems to have done here that are illegal and disrespectful, where to start? As Washington State was ground zero for the WaMu seizure and sale to JPMorgan Chase because WaMu was based in Seattle, the Puget Sound Journal has been particularly diligent in tracking down information about the process and the aftermath and reported several stories last year about how the sale of WaMu to JPMorgan Chase wasn’t actually closed, leading to speculation that JPMorgan Chase might be made to pay more for what they bought. But not, in a strange and fishy twist, the FDIC now says that at least some of the reports of the sale closing being extended are wrong, and the sale was closed last September. The sale of Washington Mutual to JPMorgan Chase & Co. closed Sept. 1, 2010, according to the Federal Deposit Insurance Corp., who said today a previous statement that the sale had been extended through October 2010 was incorrect. The Seattle thrift was closed by regulators on Sept. 25, 2008. Last August, a document surfaced that revealed the two-year-old sale was still pending because of an extension, supposedly one of many. The last time I checked with the FDIC about the status of the sale was early October 2010, and at that time spokesman Andrew Gray said the final closure date had been pushed out another 30 days. However, that information was incorrect, he told me this week. The last extension had a Sept. 30, 2010 deadline, not Oct. 30, 2010 like he thought. The sale was closed on Sept. 1, 2010, said Gray. “For some reason I was told that there was a second extension and that was not the case,” said Gray in an email. The terms of the deal remain the same, he said. JPMorgan purchased WaMu’s assets for $1.88 billion from the FDIC. Some shareholders held out hope the extension of the sale would mean the purchase price may increase, especially since JPMorgan bought the thrift for a small fraction of its $307 billion in assets at the time it was closed. However, Gray confirmed the details of the purchase and assumption agreement, which are available on the FDIC website, have not changed. I have submitted a request through the Freedom of Information Act for all the extension documents, and have been told that request will be expedited. I’ll post them on our website as soon as I receive them. We’ve documented lots of examples where Chase doesn’t bother informing customers of important things happening with their accounts, but this story has to be the worst. After reading this entire story, I am struck how the root of the problem was that Chase didn’t adequately inform a customer who was doing their best to stay current on their loan, despite some hardships, of their true obligations. It’s almost as if the people at Chase simply didn’t care what hassle and inconvenience their lackadaisical approach to banking causes people. Financed a brand new Subaru Outback from Chase Auto Finance in September, 2005. Had to file Chapter 7 bankruptcy in May, 2009, due to infant son’s medical and hospital bills. Payments were current at time of bankruptcy discharge. Did not reaffirm the loan, as we had equity in the car at that point. Continued to make monthly payments on the car to Chase via Moneygram. Paid almost $8,000 in the almost two years since the bankruptcy. Had calculated that I owed about $1,400 in March. On March 25, a tow truck showed up to repossess the car. I couldn’t believe that Chase would repossess the car for such a small amount owed and the fact that we had so much equity in it. I called the Chase bankruptcy department while the tow truck driver waited. I was told that the $1,400 was a balloon payment from when I had deferred a couple payments years earlier when my son was hospitalized. With everything that has happened since then, I had completely forgotten that the last payment would be a balloon payment. There was no notice or reminder of this from Chase. They refused to make any payment arrangements and insisted that I had to let the tow truck take the car unless I had $1,400 in cash at that very moment. The tow truck driver couldn’t even believe that they were taking it either. This is our only car. Without it my husband could not get to work, my daughter to school, or my son to his multiple therapy appointments. Even after requesting a supervisor, they still refused to work with me. Keep in mind that I would not be responsible for any of the cost and fees associated with repossessing the car, as it was included in bankruptcy and not reaffirmed. Chase would be responsible for all of that. So the car was repossessed and towed away. We had to rent a car to the tune of $234 for the week. I called Chase again first thing Monday morning. I informed them that I would be redeeming the car on that Friday morning when my husband got paid. I was given specific instructions on what to do when I made the payment in cash at the Chase branch. I then called the towing company who took the car and informed them that I would be getting the car on Friday morning. I was told to call Chase back and ask for a redemption hold. I called Chase back and they refused. I called them multiple times that week. At one point I was told a completely different person was now in charge of my account. I was given a completely different set of instructions on making the payment at the bank. I kept in contact with both Chase and the towing company throughout the week. On Thursday morning, I called the towing company and was informed that my car was in route to Manheim Auto auction almost 4 hours away from my house. I was told that they would bring it back to my city by the next day for $100. On Friday morning, just before going to the bank to redeem the car, the towing company called and told me that my car was at the auto auction and Chase refused to let them bring it back to my city. I called the auto auction and was told that they close early at 3:30 on Fridays and are not open on the weekends at all to pick up the car. I went down to the bank and paid the $1,400 and followed their instructions on having the payment receipt faxed to them. My husband had to leave work early and we drove the 4 hours to pick up the car. It took almost the entire 4 hours and multiple phone calls for Chase to fax the release to the auction in time. I arrived at the auction just before closing, but late for my scheduled appointment. The woman handling this at the auction was quite sympathetic of my situation and effort and happily agreed to let me pick up the car. I was informed that Chase would be billed for over $300 in transport and storage fees from the auction, as well as the repossession and storage costs to the towing company. So Chase was it worth wasting probably almost $700 to repossess the car? Add on the cost of my rental car and the complete waste of all of my time. And thank you for the wild goose Chase to pick up MY car! And by the way, I still to this day have never received any repossession documents in the mail from your bank and you know where I live. That is against the law! Please remember that according to my state’s laws you must send me notice of release of lienholder within 15 calendar days. It is now day 8. I do expect to receive my title in a timely matter. Chase Bank…I will never forget this experience with you bank and I will never ever do business with you again. I like to remember how much money our government bailed toughie with and this is the thanks you give to hard working families? 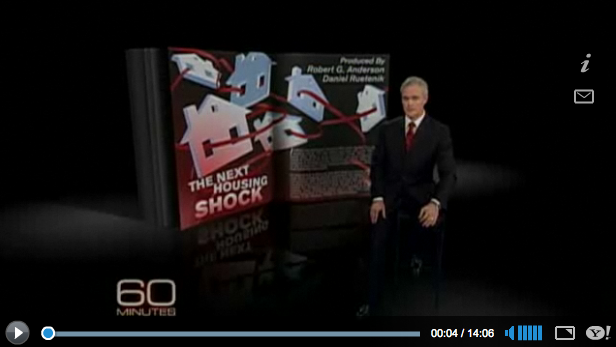 60 Minutes did a segment on the forging of documents (that were most likely lost) by banks pursuing foreclosures. This is a huge story and could potentially affect tens of thousands, hundreds of thousands, or millions of homeowners that have been foreclosed upon or are threatened with foreclosure. As more and more Americans face mortgage foreclosure, banks’ crucial ownership documents for the properties are often unclear and are sometimes even bogus, a condition that’s causing lawsuits and hampering an already weak housing market. Scott Pelley reports. You an watch the video here and read the associated CBS story here. At issue here is that banks, in their brilliant move to electronic system called MERS to record changes in ownership of mortgages as they were sliced, diced, and sold as securities, either lost or destroyed the original mortgage and change of ownership documents. They did this to avoid having to file paperwork with county clerks every time some part of a mortgage changed hands, saving them millions. But it turns out that filing with county clerks is a legal requirement and courts have begun to reject MERS filings as proof of mortgage ownership. So what did banks do? According to this story, they started to forge the original documents. If any of the loan documents provided to you by your bank or mortgage servicing company are signed by Linda Green, they are likely fraudulent.